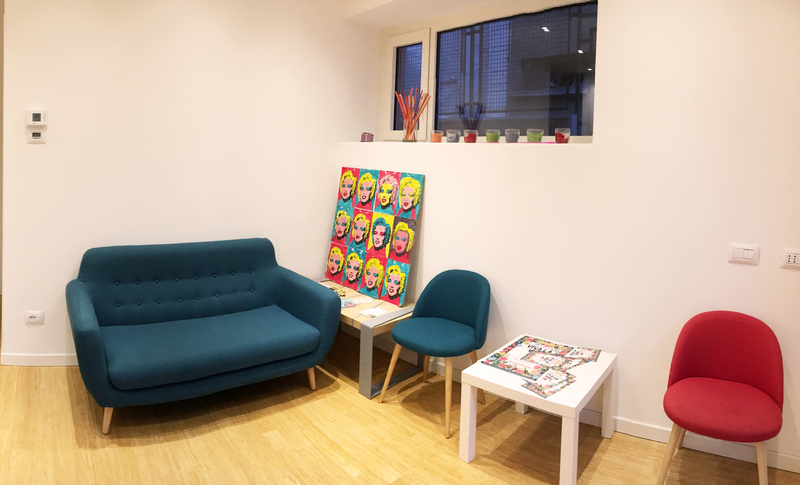 The Family Corner is a space realised for parents and children, equipped with a cosy living room, changing table, bottle warmer, coffee and tea table and free wifi. The perfect space where to spend pleasant hours with your babies when you don’t know where else to go or just for a quick pit-stop. Warm rooms, a rich meetings and labs programme, with great occasions for socialising. It’s a small corner out of chaos. You can find consultants, workshops and conferences for families, but also arts and crafts for children. You can decide to rent the space to host a birthday party or a small event. 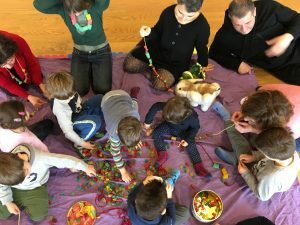 You will also have the chance to take part to our weekly English playgroups (for children and parents together) and you can keep fit thanks to Lara and her courses, created and studied for women. It’s possible to rent both the indoor and outdoor spaces for birthday parties and other events, both with all-inclusive packages and with rent-only offers. Contact us to have more details. Would you like to gradually introduce English language in your children’s life? Would you like to give your girl the chance to travel abroad without communication problems? Do you often think about the opportunities that you didn’t have and that you would like to give to your son? Are you an English speaking parent who would like to offer your bilingual children occasions for playing in English also outside home? There are many reasons why you want to teach English to your kids, and Early Childhood is the ideal moment when to start. The earlier the child is exposed to the language, the better it is. Childhood is the period when children learn to talk in their mother tongue and the learning process works in the same way with a second language as well. Like the mother tongue, a second language needs a social context in order to be learned, and kids learn faster when they are together with other kids to play with. That’s why the playgroups Learn with Mummy were born. During the playgroups we play, we read, we act and we sing. All the tools that we offer during the weekly meetings will be very helpful to parents, that will be able to repeat the activities at home. Repetition helps children to learn. Your child will be the one to ask you to sing, read and play in English! The goal is this: to boost the children’s curiosity and wish to learn English. This wish, if correctly promoted, will be part of his entire life. During our playgroups we only speak English. Always. Nobody speaks Italian, not even the parents. All the activities that we do can be, or rather, have to be re-introduced at home, through DVDs, CDs, books, songs and games. This because no child can learn a second language just with a weekly one-hour course. The parent’s role is crucial. The playgroups follow the school calendar (but they start in October and they end in May). There are playgroups during the week or on Saturday morning. Contact us to find the perfect solution for your frenetic weeks. A path created by a woman and dedicated to all the women that don’t want to give up or to make do with what they can have. This path follows and supports the woman in her crucial life steps. Gymnastic for pregnancy: in order to increase awareness about your body, to keep it in good shape and to get ready for giving birth. The pregnancy months are full of big physical and emotional changes for the mummy to be: a good physical activity is very important to live in full harmony this amazing experience and to prevent some typical unpleasant effects. You can participate from the fourth month until the childbirth. Post-birth Gymnastic: every mother knows how much energy you need to take care of a new-born. But just when you really want to be at your best, you feel the effects of the pregnancy and the delivery. Two months after the childbirth it’s important to start restoring the body functionality and tone. A funny course that you can do together with you baby. Perineal Gymnastic: a 10 classes course where the goal is to eliminate that mystery and shame feeling surrounding this part of our body, the perineum. It’s the centre of our body, it gives us joy and pain, but it’s very often neglected: very small and easy to solve problems are too often considered “normal” and kept hidden. Suitable for women of any age. Postural Gymnastic: Muscular Stretching, Articular mobility and body balance. This discipline involves the whole body, anybody can take part, you don’t need special skills. It’s perfect for those who suffer from postural pain and don’t love tiring activities. It’s the perfect integration for those who already train and wish to improve their performances (for any sport chosen). Recommended also for those who want to enter for the first time in the physical activity world. Osteopathy is a manual medicine created by Andrew Taylor Still in 1874. It is a non-invasive method of treating our body, suitable for everyone, based on the principle of self-healing. Our body has in itself all the capacities to stay healthy and recover from a disease. The role of the osteopath is to enhance this capacity. The first goal of an osteopathic treatment is to eliminate pain and allow the body to find its correct functioning. Then it’s important to restore a correct postural pattern that allows the patient to maintain a perfect long-term balance. The Osteopath D.O. Lara Ghisoni can handle problems such as back pain, neck pain, shoulders and arms, but also hips, knees, feet, sciatica, pubalgia; headache and migraine; postural asymmetries; scars, post-surgical and trauma injuries; visceral disorders. She is specialized in the treatment of children, pregnancy and specific female pathologies.